Unsurprisingly, the cosmetics maven’s make-up was exquisite, and included a smokey eye, subtle blush and rose-tinted lipstick. While at Delilah’s for their private party, the group were treated to the use of a ball pit and had a massive family mural created. 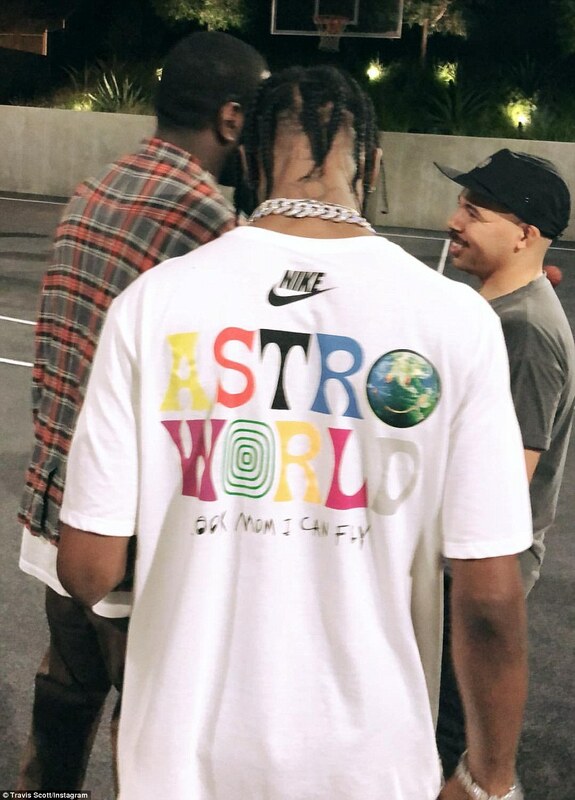 Of course, just about every other Kardashian/Jenner were in attendance. Even queen Kim, 37, took time out of her busy schedule to stop by. Like Kylie, she opted for a pink outfit, albeit one that prominently displayed her cleavage. She wore purple strappy sandals and carried her belongings in a clashing see-through bag which gave a glimpse into her belongings. Her raven locks were styled into a long and curly hairstyle as she had her extensions back in after recently chopping them off to try out a short bob. However, the wife of musical artist Kanye West quickly discovered she was not into her new look and swiftly called her hairdresser. Half-sister Khloe, 34, arrived in a glittering silver co-ord, which showed off her own flat midsection just four months after giving birth to baby True. Paying close attention to detail, she carried a chic silver clutch bag which had a quilted detail and matched her outfit perfectly. She also added some inches to her height with a pair of discreet perspex heels – with sister Kourtney offering her a gentle arm of assistance as they prepared to navigate their way up some steps together. Eldest sister Kourtney, 39, also drew some glances thanks to her shimmering violet number which was suspended by thin spaghetti straps. The low-cut design showed off her cleavage and her legs looked incredible in the mini, with their dusting of glittery powder which added some further disco fever. She wore a pair of very high-heeled strappy sandals as she made her way inside, wearing her raven locks up in a high ponytail. She recently called time on her relationship with boyfriend Younes Bendjima. 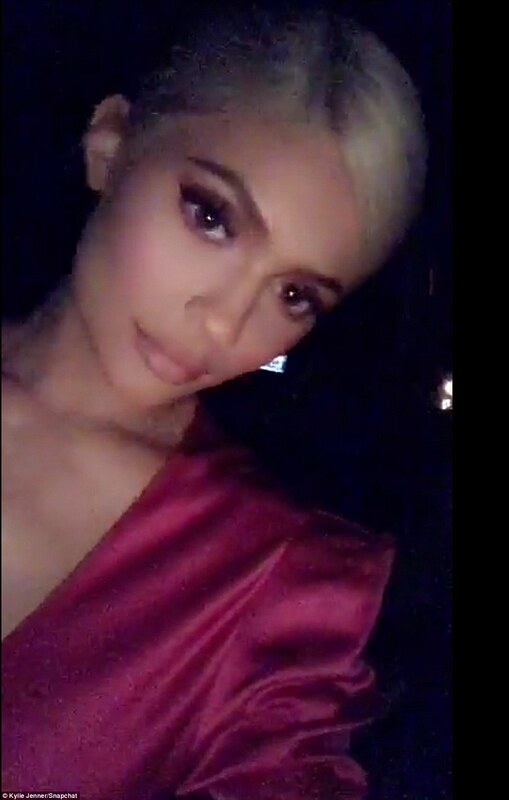 And Kourtney had her family ‘dreaming’ of a reunion with her ex-boyfriend Scott Disick as they both attended Kylie’s birthday celebrations. 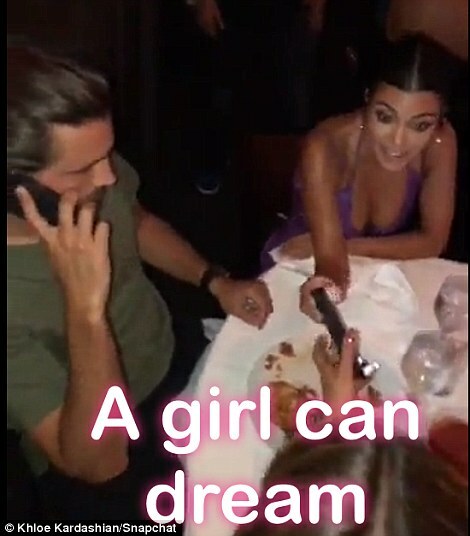 Despite being famed for their tumultuous relationship, the reality star – who shares three children with Scott – looked more than amicable as a wishful Khloe Kardashian shared a clip of the pair sat next to each other at the dinner table, writing: ‘A girl can dream’. 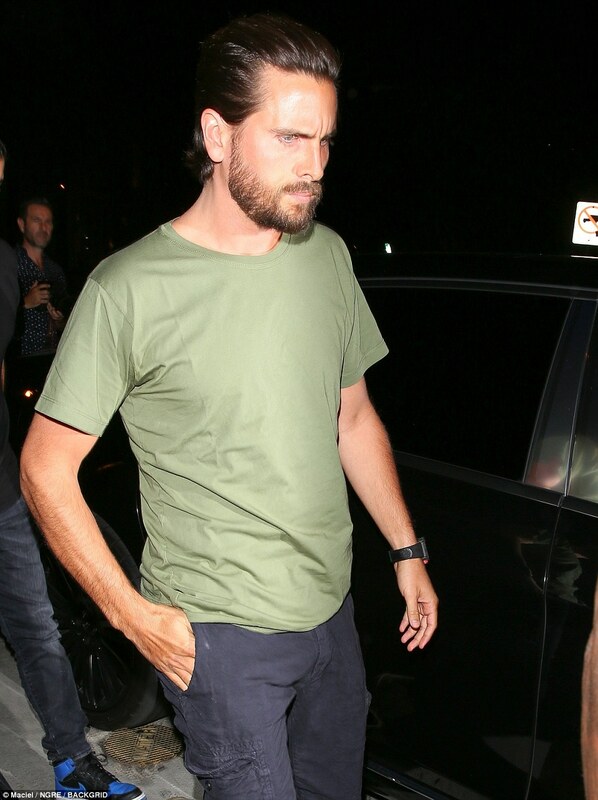 Scott kept it casual in a plain green T-shirt, black pants and tan boots. Kourtney and Scott started dating in 2006 and have eight-year-old son Mason, six-year-old daughter Penelope and three-year-old son Reign together. They broke up in 2015 and Kourtney started dating Younes in 2016, with Scott dating Sofia Richie since May 2017. She arrived with supermodel Kendall, 22, who chose a black strapless garment which barely covered her modesty. Momager Kris, 62, looked more than proud of her brood, as she arrived with boyfriend Corey Gamble. For the big event, the matriarch donned a black pantsuit festooned with large brass buttons.